The 57.3 metre motor yacht Zenobia has been listed for sale by Rytis Babravicius and Fernando Nicholson at Camper & Nicholsons. Built in steel and aluminium by famed German yard Abeking & Rasmussen to a design by Donald Starkey, she was delivered in 2003 and has only been privately used since new. Her interior by Alberto Pinto offers extensive accommodation for 16 guests in eight luxurious cabins consisting of two full beam master suites, two VIP suites on the upper deck plus a further three doubles and a twin cabin below deck, all with full en suite bathroom facilities. Reception areas in the saloon are generous and include ample space for relaxation, entertaining and fine dining. Zenobia also has very large deck areas offering multiple areas for entertaining and al fresco dining while there are nooks and corners where guests seeking privacy can curl up with a good book. Twin Caterpillar 3516 DITA engines of 1,977hp each give her a cruising speed of 14 knots. 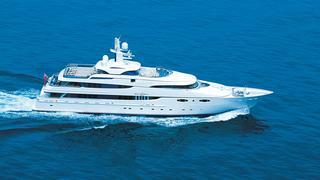 Refitted in 2008 and MCA compliant, Zenobia is asking $46 million.